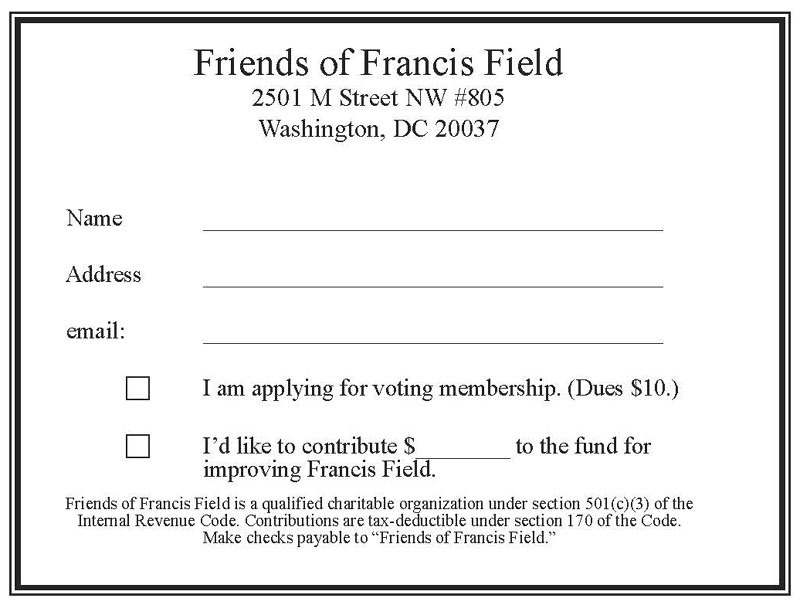 Friends of Francis Field (FFF) is a group of residents interested in improving Francis Field, a recreational facility and park in the West End neighborhood of Washington, DC. It was organized in 1998 and incorporated as a non-profit organization in 2008. It was granted tax-exempt status by the Internal Revenue Service in the same year. The MapQuest map at left shows the field's location. It is about nine blocks west of the White House. 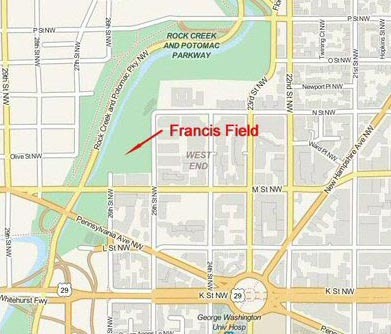 Francis Field is located on the west side of 25th Street NW, between M and N Streets. It is partially owned by the National Park Service and is part of Rock Creek Park. The eastern side of the field was transferred to the District of Columbia in 1971. The entire field is managed by the District's Department of Parks and Recreation. In June 2013 FFF entered into a "Park Partners" partnership agreement with the Department of Parks and Recreation, which allowed it to make improvements on the field with private funds. That public-private partnership was extended on March 1, 2017, and again on March 1, 2018. FFF is governed by a Board of Directors who are elected for three-year terms. FFF has only one class of members. Members are admitted at the discretion of the Board, but membership is open to the general public, and is not limited to the residents, property owners, or business operators in proximate location to Francis Field. Dues are $10 per year. The Board of Directors appoints the organization's officers. Our major event each year is the Annual Meeting, held in a public place, usually with refreshments and a slide presentation of the organizations plans for the year ahead. 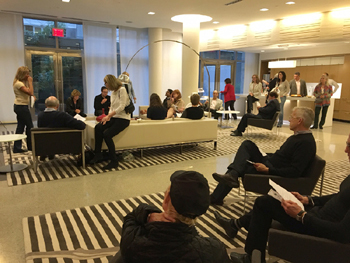 The photo at right shows the 2016 meeting, which was held in the lobby lounge of the WestEnd25 apartment building on April 28, 2016. The 2018 meeting was held on April 19, 2018, in the lobby lounge of 2501 M Street. Dues are accepted by check or by credit card using PayPal. The "Donate" button below takes you to the PayPal website, which accepts all major credit cards. No personal information is kept on this FFF website. You do not need to have a PayPal account to donate by credit card, but you may use your existing PayPal account if you have one. This same button may be used to make contributions to the organization. For members we need either a mailing address or an email address so that we can inform our voting members of the Annual Meeting, and other meetings. These addresses are not stored on this website, and will not be sold or used for any other purpose than informing our members of activities. Notifications by email or U.S. Postal Service should not exceed four per year. You can also donate or pay membership dues by check or money order. A larger version of the card at left can be printed from a PDF file on this website for your convenience. It prints out on one sheet of 8-1/2" x 11" paper. Click for the printable version here or on the form at right.